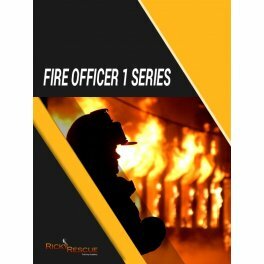 The Fire Officer 1 Series satisfies part of the Florida State Fire pre-certification requirements for Fire Officer 1. This is a 45-hour, self-paced, online fire course with continuous open enrollment. It forms part of the mandatory coursework for Florida Fire Officer 1, Florida Fire Inspector 1, and Florida Fire Investigator 1. Completion of this course will ensure that you meet the Job Performance Requirements required by NFPA 1021 and NFPA 1031. Students will also earn 45 CEU’s towards the Florida State Fire Inspector certificate renewal program. This course is designed to familiarize students with the features found in various types of construction and the hazards they present in fire conditions. Students will study construction standards and policies and how these affect a building’s behavior in a fire event. The course also covers construction industry definitions and terminology. This is a 45-hour, self-paced, online fire course with continuous open enrollment. It is part of the mandatory coursework for Florida Fire Officer 1. Completion of this course will ensure that you meet the Job Performance Requirements required by NFPA 1021. The course is designed to familiarize students with the kind of problem and issues they will face, and be expected to manage, as a first level Florida Fire Officer. Students will study basic theories of supervision and leadership, and look at how they relate to this role within a fire company. The course also analyzes effective leadership types as required by the Fire Service with a focus on roles and attitudes essential in high-stress situations. This is a self-paced, online fire course with continuous open enrollment and is one of the compulsory courses for Florida Fire Officer 1 certification. Completion of this course will ensure you are able to meet the Job Performance Requirements required by NFPA 1021. The course is designed to teach students about the essential responsibilities and actions involved in dealing with and managing fire emergencies. Particular focus is given to the procedures required to determine the most effective use of available resources to protect lives and property. The course also covers ways in which emergency situations can change rapidly and teaches the fire officer to rapidly assess how effective their proposed incident plan will be as situations change. This is a blended, self-paced, online fire course with continuous open enrollment. This course includes a mandatory, eight-hour, classroom component. It forms part of the required coursework for Fire Officer I, Fire Instructor I, Fire Instructor II, and Fire Instructor III. The course complies with NFPA 1041, Fire Service Instructor Professional Qualifications, and Florida Rule 69A-37. Students will also earn 45 CEU’s towards the Florida Fire Instructor and Florida Fire Safety Inspector renewal. This course covers principles and theories of adult learning. The course is designed to familiarize students with proven techniques for effective communication in a variety of teaching situations. This course also covers the methodology and mechanics of teaching, and how to measure teaching effectiveness. The course also provides information regarding the use of media and visual aids and devices required for specific training areas. Successful completion of these courses, in addition to the required Florida Fire Officer 1 task book, will qualify you to take the Florida Fire Officer 1 Certification Exam through the Florida Bureau of Fire Standards and Training. In addition to enrolling in the Fire Officer 1 Series, students must purchase the required textbook for each course.